In glycolysis, 2 ATP molecules are produced from each triose phosphate molecule (to give a total of 4 ATP produced; 2 net produced as 2 were initially used up in the reaction). I don't understand how this would be the case, as each triose phosphate only has one phosphate group available to form ATP from ADP, meaning that one ATP is produced per triose phosphate. I know this cannot be the case as this would mean a 0 net production of ATP defeating the purpose of glycolysis, but i can't get my head around why. but you are wrong here as each triose phosphate is destined to undergo phosphorylation before they are dephosphorylated to yield 2 ATPs each. 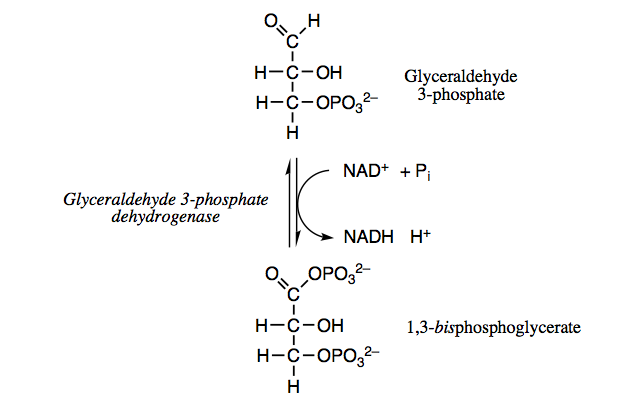 You can see that out of the two trioses Glyceraldehyde-3-phosphate is phosphorylated into a compound (1,3-bisphosphoglycerate) that has two phosphoryl groups. Similarly Dihydroxy acetone phosphate the other triose is first converted into glyceraldehyde-3-phosphate by an isomerisation reaction catalysed by triosephosphate isomerase. This glyceraldehyde-3-PO$_4$ formed undergoes phosphorylation to form a two phosphoryl group containing compound. would the other remaining two phosphates that are required come from other sources..? Yes the Phosphate group added to Glyceraldehyde-3-PO$_4$ is derived from orthophosphate (HPO43−). This is covered in Berg et al. Section 16.1.5. *The term inorganic phosphate is used because there are various different anions in solution derived from phosphoric acid, depending on the pH. At physiological pH the predominant species is the double-negativly charged, monohydrogen phosphate. Not the answer you're looking for? 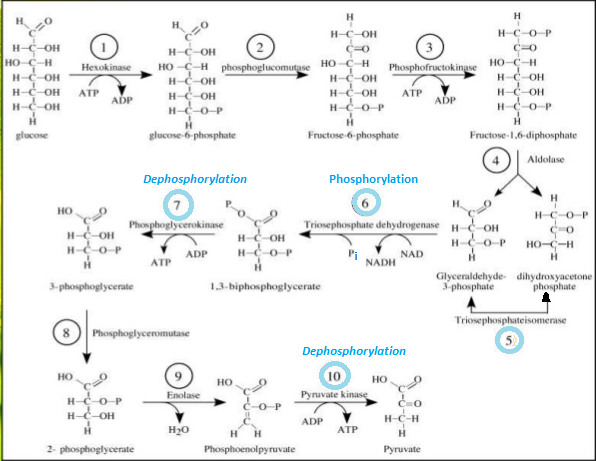 Browse other questions tagged biochemistry respiration phosphate or ask your own question.